Bitcoin, and many other projects, embody a transformative movement of decentralization and democratization of some crucial aspects of how our societies work. Unspent’s ultimate goal is to make this movement more approachable, to make it easier to understand projects, markets, and what it means to be financially invested in them. The first step in that direction is what Unspent is today: a portfolio tracker that goes beyond just that. After opening up Unspent to a few hundreds early users and friends at the end of last year, the larger crypto ecosystem has kept on growing and improving steadily, and Unspent did too. Not using Unspent yet? Give it a try today, or just see what it looks like! While Unspent already offers a good amount of simple and powerful features, today we’re releasing two powerful features that we hope you’ll love just as much as we do. Unspent goes beyond portfolio tracking, and those features are a good example of that. I like this tool a lot. 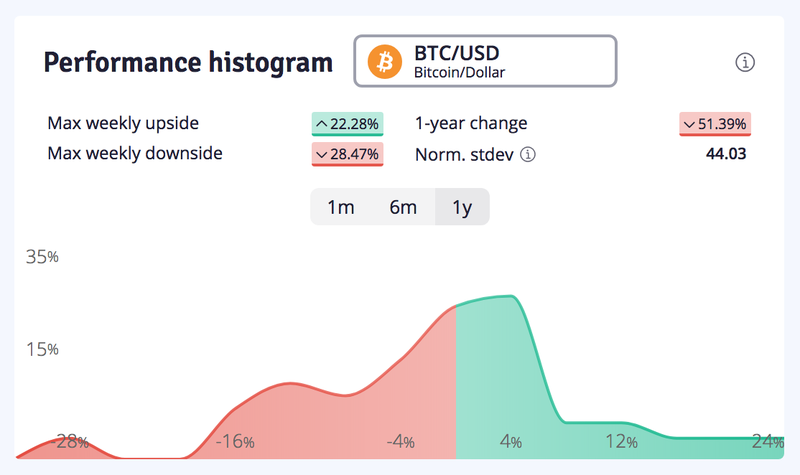 It gives useful information in just a quick glance, and can tell a lot more about the performance and volatility of any asset if you dig deeper. This histogram is a visual way to represent how often, over a given period of time, a specific asset has been up or down, and by how much. BTC/USD has seen a lot of red, with weekly downsides as low as -28%. 37% of the time, it has seen weekly downsides of anywhere between -4% and -16%. And 25% of the time, it has seen weekly upsides of only 2% to 10%. A normalized standard deviation so low confirms that volatility has indeed been very low this past month: nothing compared to the past year! 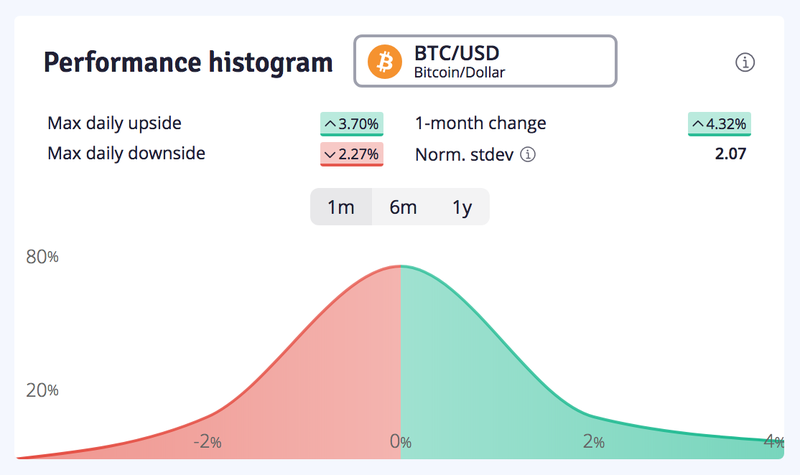 With this tool, you can analyze the performance and volatility of any existing crypto-asset – or even your portfolio as a whole! This correlation chart shows how two assets (or baskets of assets: large caps, small caps, your portfolio…) move in relation to each other over different periods of time. Correlation is measured on a scale of -1 to +1. When correlation is above 0.7, it’s generally considered strong: the two assets move in very similar ways; below 0.7, the correlation is weak: the two assets have been moving in different ways. When correlation is positive, assets move in the same direction; when it’s negative, they move in opposite directions. 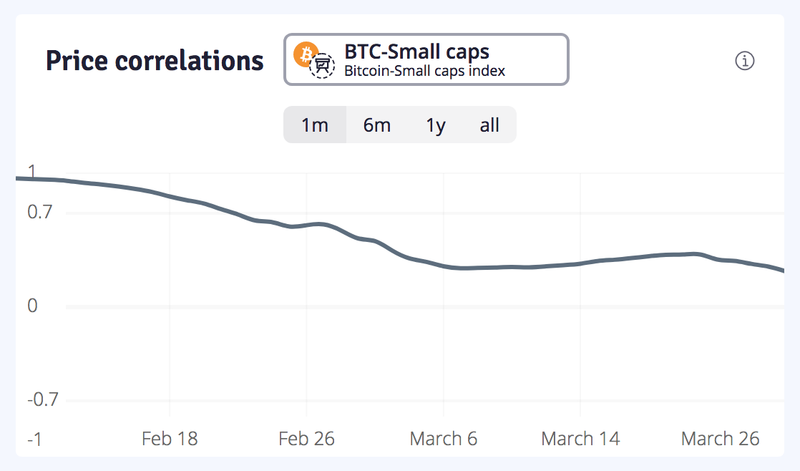 The chart above shows the correlation between BTC and all small caps over the past month and a half. It’s clear that those two sides of the market have been moving in very similar ways up to roughly February 18, and they very much decoupled since then. Unspent’s goal is to provide helpful tools to as many as possible, and all of Unspent’s features are available for free to everyone. Some reasonable limitations are in place, but the aim is that most users shouldn’t feel the need for more power. Still, to be able to work on building and improving these tools for you in a sustainable way, and contributing to the ecosystem more and more, Unspent needs to be able to pay for a few expenses. This is the reason why Unspent Pro exists: it’s a way for advanced users to save even more time and get deeper insights from Unspent, while also supporting us. Today marks an important milestone for Unspent, yet it’s also just the beginning: there’s much more to come, and we can’t wait to keep saving you more time, providing you with even more insights, and generally making this whole ecosystem more approachable to everyone who’s invested in it. If you haven’t tried Unspent yet, have a look around!